Malcolm Douglas (14 March 1941 – 23 September 2010) was an Australian wildlife documentary film maker, and crocodile hunter. Douglas started in the 1960s as a professional crocodile hunter and farmer, but later dedicated himself to their preservation. 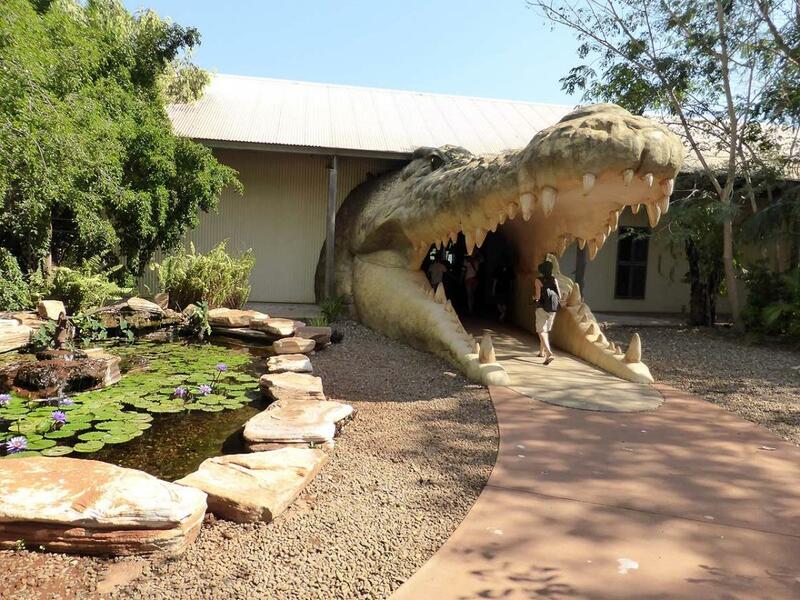 The Malcolm Douglas Wilderness Wildlife Park is about 15 minutes from Broome on the Broome Road and is open every day except Christmas Day. We arrived at the park for a quick look around before the daily crocodile feeding demonstration. The guide brings out baby crocodiles with their jaws taped for the audience to hold before the show begins. They were about two years old and have been bred for their skin - cold to touch. The first feeding is in a very large pen - holding about 70 crocodiles. The water is very murky with a green growth on the top and it is very difficult to see these creatures until they come out of the water to compete for the food on offer. The demonstration takes you to several enclosures to feed different crocodiles and then onto the Alligator enclosure - they are not nearly as aggressive. After the crocodile feeding we spent some more time looking at the other animals housed at the Wilderness Wildlife Park - birds, dingos (including the rare white and a black), echidna, kangaroos, cassowary, emus, jabiru, snakes, lizards and more. have you been to Malcolm Douglas Wilderness Wildlife Park? Malcolm Douglas' Wilderness Wildlife park was a great day out. I got to hold a baby crocodile which was awesome. We tagged along on the crocodile feeding tour which was amazing to see. Those animals can move! The guide was super friendly and stayed behind after the tour to answer all of our questions. Malcolm Douglas Wilderness Wildlife Park, BroomeRvTripsMalcolm Douglas' Wilderness Wildlife park was a great day out. I got to hold a baby crocodile which was awesome. We tagged along on the crocodile feeding tour which was amazing to see. Those animals can move! The guide was super friendly and stayed behind after the tour to answer all of our questions. Explore Malcolm Douglas Wilderness Wildlife Park - Broome with RvTrips and find out where to stay, what to do and what to see. Helping caravan, motorhome and camper owners have a great holiday.